She had porcelain veneers done a couple of years ago, but she absolutely hated them. They were too bulky, the colors were mismatched, her gums were red and swollen around the porcelain veneers and the cosmetic effect was terrible. She mentioned that her porcelain veneers looked fake and "people would look at her and just shake their heads". 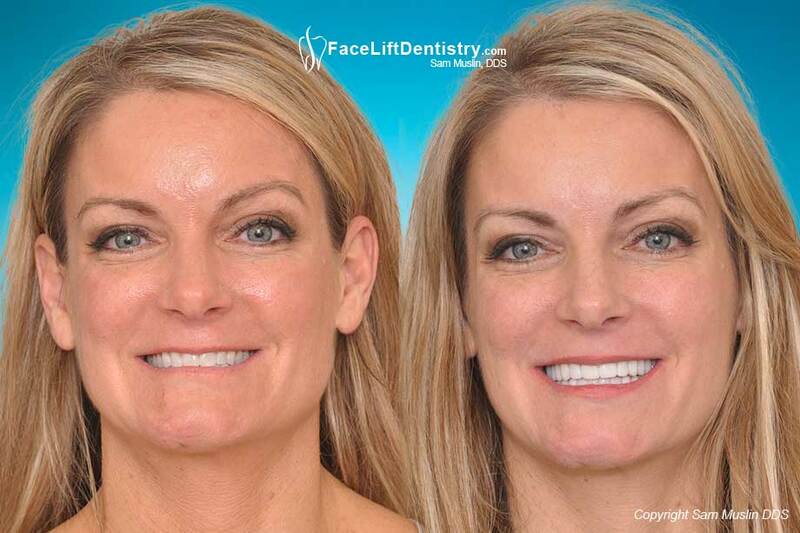 She contacted Dr. Muslin to enquire about replacing her bad porcelain veneers. 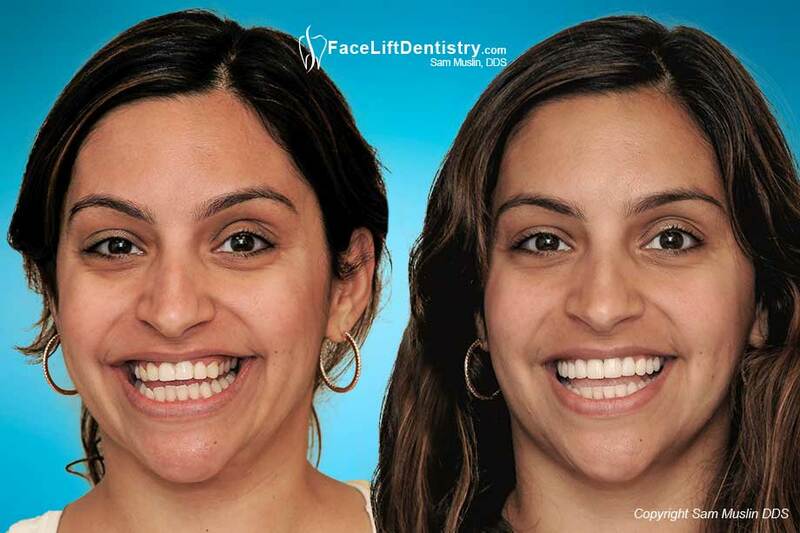 Many patients want straight looking teeth and as we all know, teeth really can help with self-confidence and the impression that the patient will give to other people. The first impression we give is important and straight teeth can really set the tone. 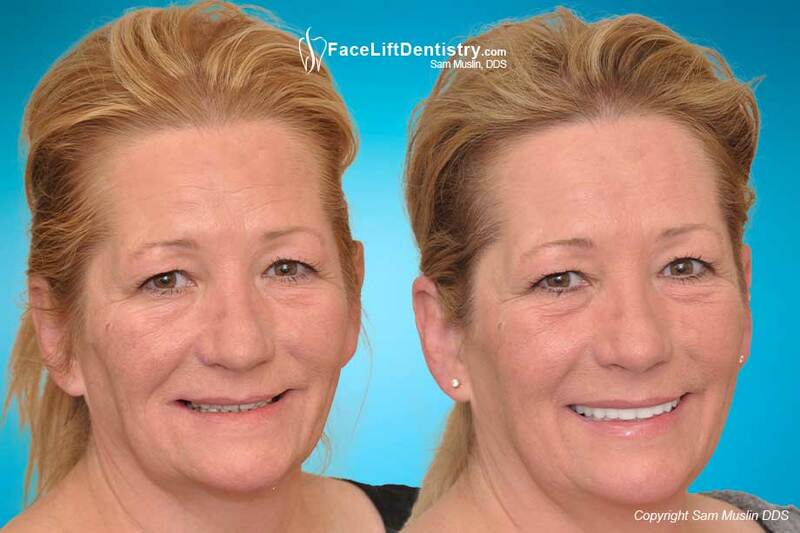 This patient decided on getting porcelain veneers and the dentist she went to was giving her best effort. However, the result was bad porcelain veneers that did not fit her teeth well enough so her gums got infected. She was very disappointed in the result. She explained how she went to a dentist, who is considered as "one of the best" in her country, and that dentist recommended Lumineers®, a type of veneer placed without grinding. 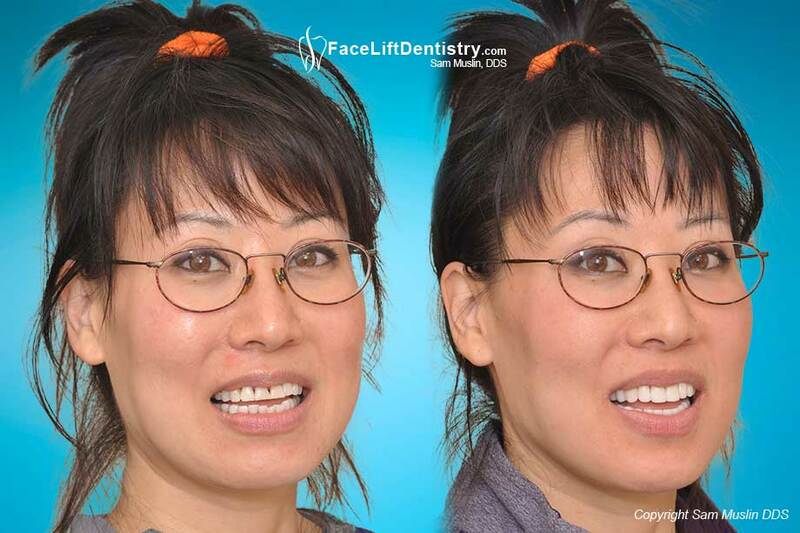 After these facial veneers were placed, she was very displeased with the results, but did not know what she could do. She could not stand the thought of looking like this for the rest of her life. Bad veneers can be removed without grinding the natural tooth structure and this patient really hated the porcelain veneers in her mouth. Listen to her tell her story of traveling half way around the world to her bad porcelain veneers replaced. She will tell you how she feels about the results. The Best Cosmetic Dentist In Santa Monica! While vacationing in Santa Monica, Samantha stayed in one of the finest hotels along the ocean, the Hotel Oceana, which is just minutes away from our office. 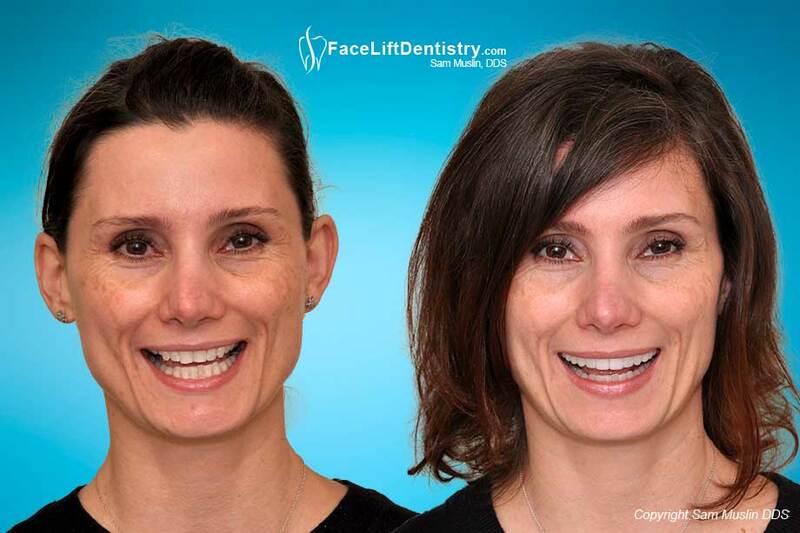 She found Dr. Sam Muslin on the Internet and was so impressed with the before and after photos on his website because they were well matched and untouched and unaltered. 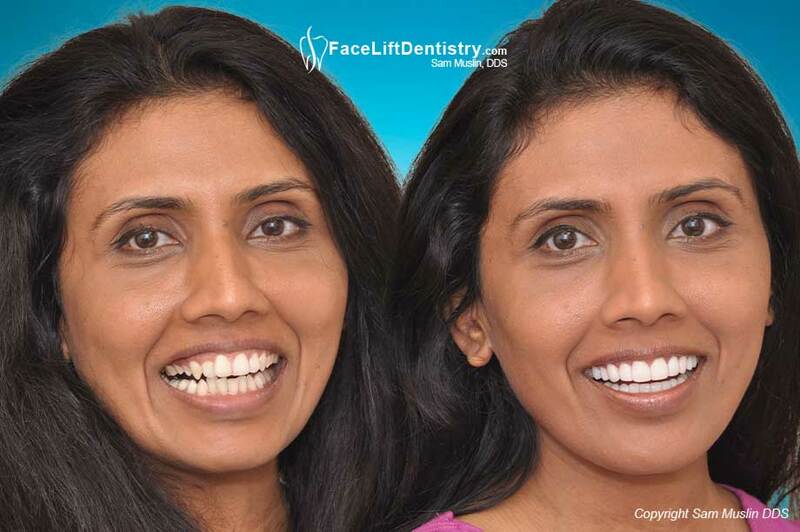 No other dentist has the same quality of 'before and after photos" of actual patients. She said, “I just found the best cosmetic dentist in Santa Monica and I am going to make an appointment”. After the initial appointment, she was eager to get started and get her new teeth done during her stay in California. There were only two weeks left of her trip before she had to return to Bahrain in the Arabian Gulf, so all of her care had to be highly organized. 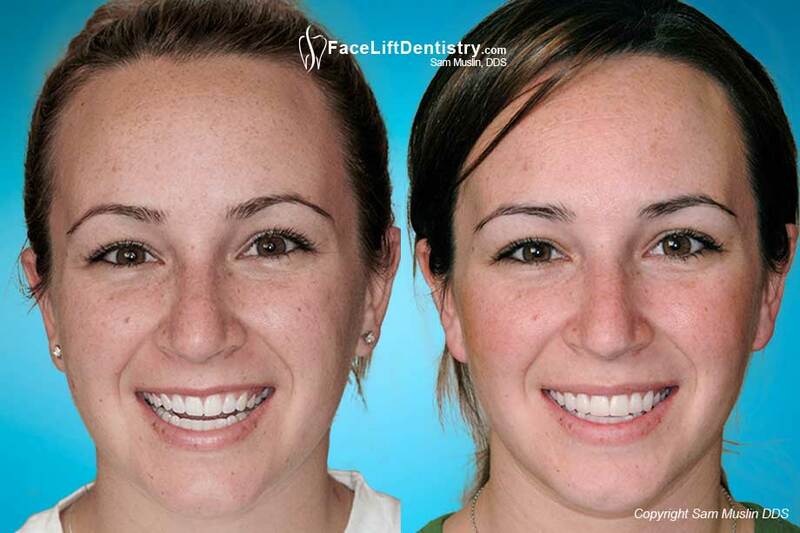 Before replacing her bad porcelain veneers, the first week was used improving the health of Samantha's gums, which were so badly infected due to the previous bad porcelain veneers. At the start of the second week, her bad porcelain veneers were removed and temporaries were placed. 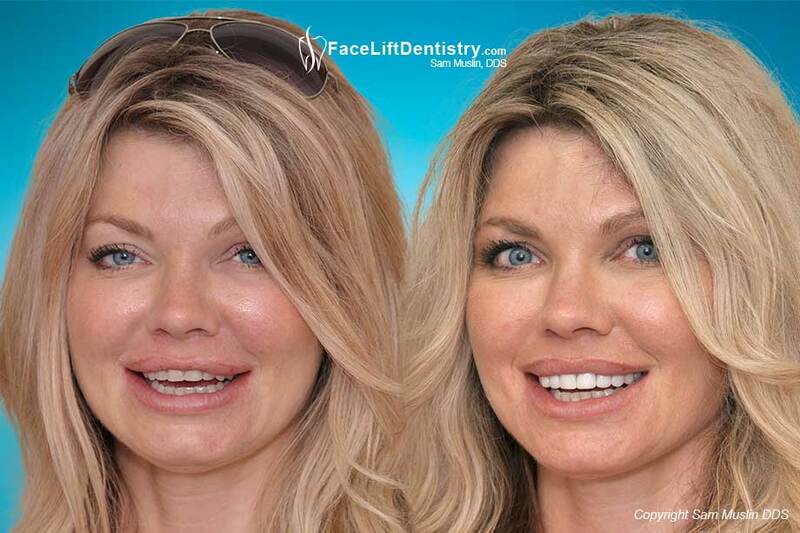 The temporary veneers lifted Samantha's hopes because they already looked much better than what she had before. 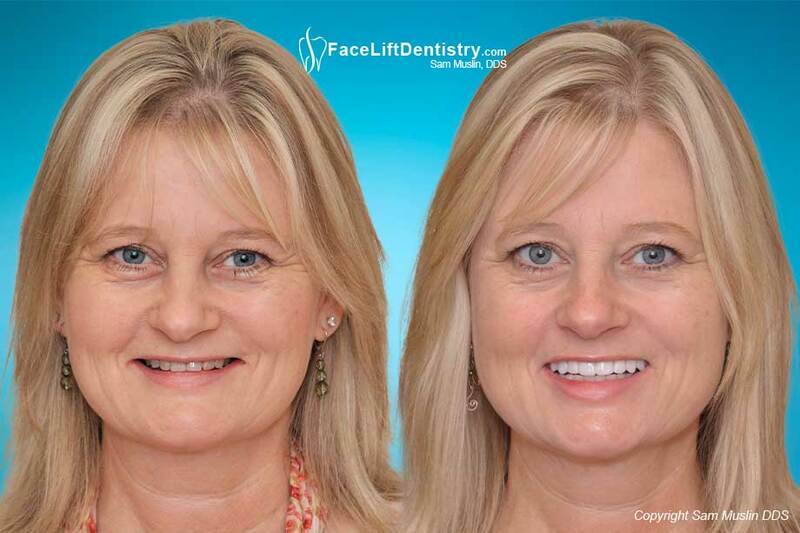 Dr. Muslin explained to her that Lumineers ® are good porcelain veneers but the dentist she chose was the problem. She became more confident that Dr. Muslin could deliver spectacular results with only one week remaining on her trip. Before bonding the porcelain veneers in place, Dr. Muslin tests the porcelain veneers on the patient's teeth so he or she can see the results and give their approval. When she saw her new high tech porcelain veneers, she was shocked. "I can't believe it," she said, "they look better than I ever thought possible. Thank you." Her veneers look so natural and now match her lively personality. She finally has straight white teeth! Dr. Muslin did not have to grind down any more of her teeth. 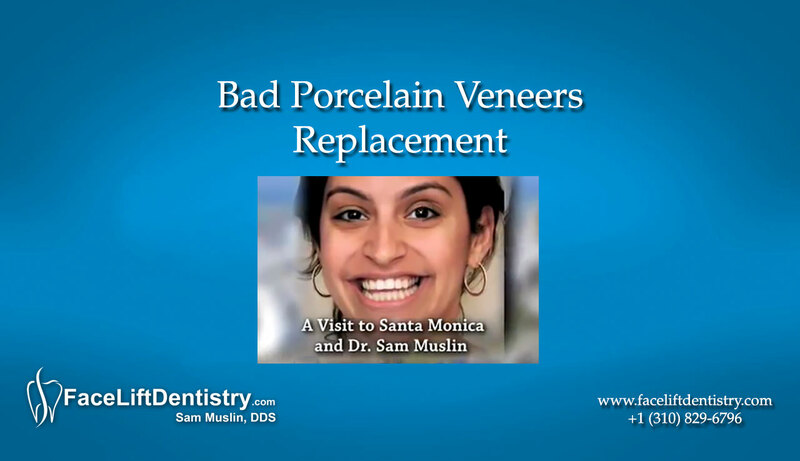 According to Dr. Muslin, the problem with her bad porcelain veneers was not due to the Lumineers® as much as there were technical problems with how they were bonded. General Dentists who claim to be cosmetic dentists are simply trained to "fix" your teeth. Because cosmetic dentistry is not recognized as a specialty, any general dentist can take a weekend course and call themselves "cosmetic dentists". Replacing bad porcelain veneers should be done by true Cosmetic Dentist, whois trained to use his artistic skill and "create" a beautiful and healthy smile. 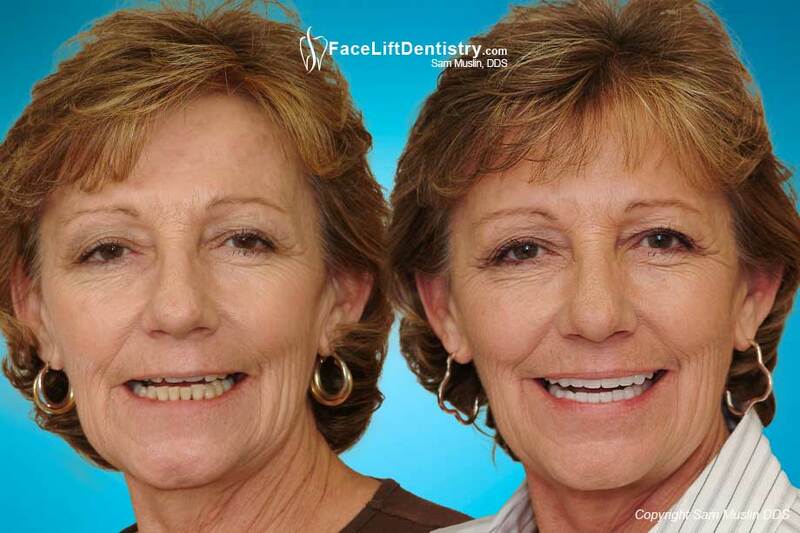 Is Facelift Dentistry® too Expensive? He could not speak clearly, chew well and had clicking and popping jaws. After treatment he speaks clearly, chews well and the TMJ problems are gone with this method. 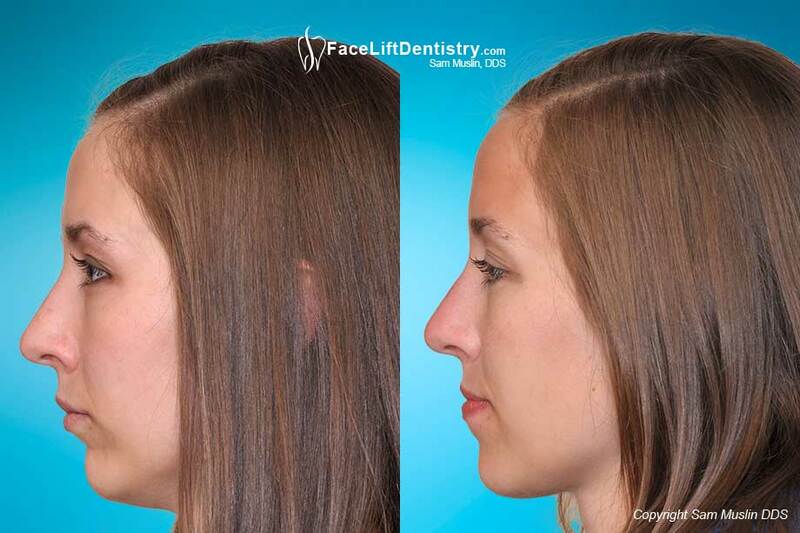 She was treated by a prominent neuromuscular dentist for a full mouth reconstruction to correct her bite. The patient suffered for 9 months and drove from Montana. She said, “Dr. Muslin knows where the jaw should be while other dentists just guess”. Patients experience gum recession along with the loss of the papilla or gum between their teeth leaving an unsightly “black triangle” space. Read her email that was sent about week after treatment. Corrected Underbite in Two Weeks! 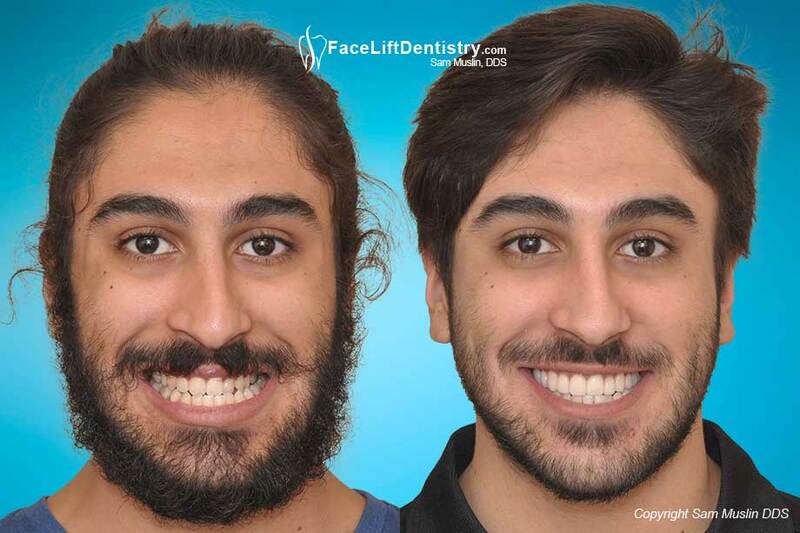 See this stunning video taken of this patient before bite correction and after underbite correction that was completed in just two weeks without pain, loss of work and without grinding down any of his healthy teeth. Can't be done with porcelain veneers. Most of us never had the best bite for our facial structure but youth hides many flaws. Today the technology exists that can correct an overbite in just a couple of weeks without surgery, braces and without grinding down healthy teeth. The quality of life centers on how are we going to live and how healthy are we going to feel. Old worn down teeth contribute to physical stress and strain. Even if you are not aware of it, your body feels it. 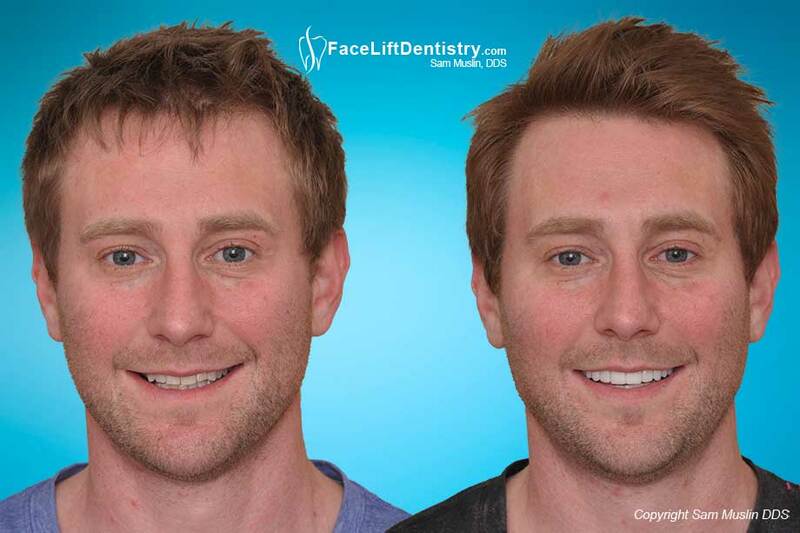 In just 3 weeks his facial profile and large lower jaw were dramatically improved with the only non-invasive underbite correction method, Face Lift Dentistry®. You can’t do this with porcelain veneers. The goal of treatment is to achieve cosmetic benefits that do not require grinding down healthy teeth, placing temporaries and later bonding the porcelain veneers to the patient’s dentin. Bonding to dentin is 5 times weaker than bonding to the patient’s enamel. 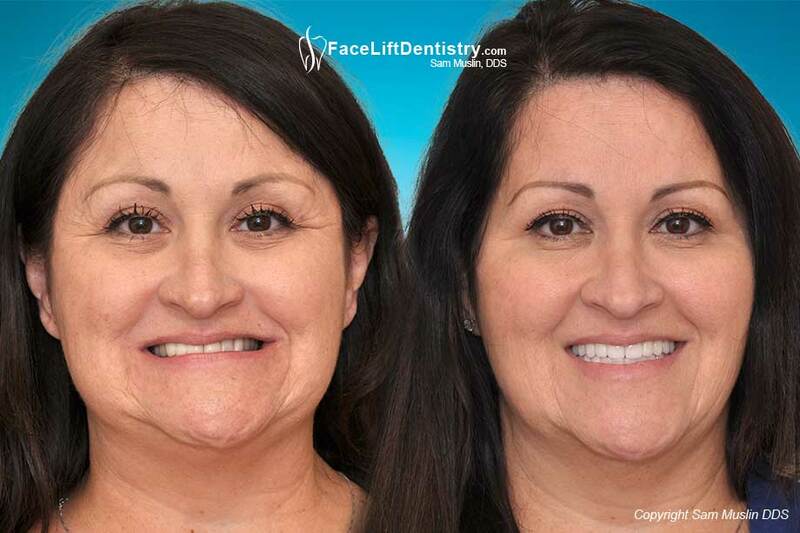 Porcelain veneers cannot improve the shape of the face, which is why she flew in from Ohio to receive the Face Lift Dentistry® Method. Years of premature aging were reversed. Not cosmetic camouflage but real underbite correction to improve the jaw position. He came from Chicago for treatment. Bite correction usinging VENLAY® restorations without surgery, braces and without pain. The first reaction of most patients is that this treatment is “too good to be true”. Is it really possible to correct the patient’s overbite without grinding down the teeth? I really want to avoid surgery and braces? Is there a catch? One of the best solutions to the aging face is bite correction because the bite directly determines controls the shape and proportions of the face. 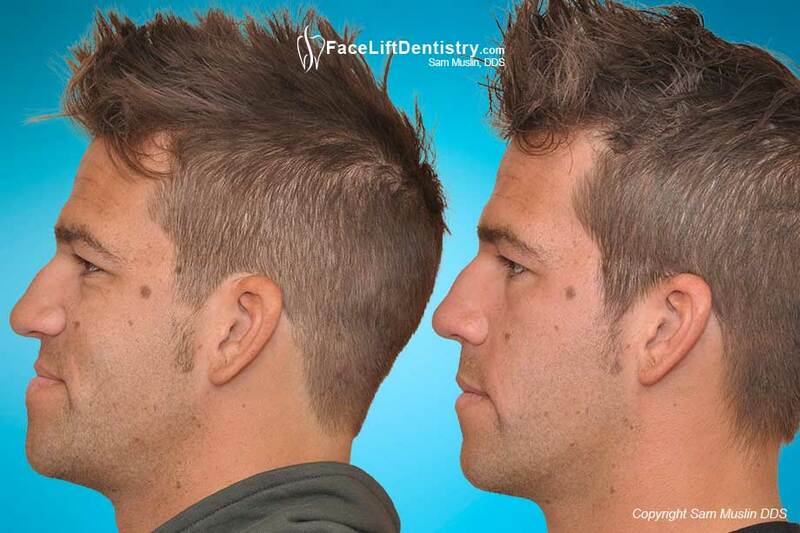 This treatment is designed to improve the patient physically and cosmetically. Because overbite correction is now possible without grinding down healthy teeth younger people are getting treatment. No braces or surgery is needed and the treatment is completed in just weeks. TMJ Pain - Jaw Clenching - Facial Tension - Teeth Grinding. 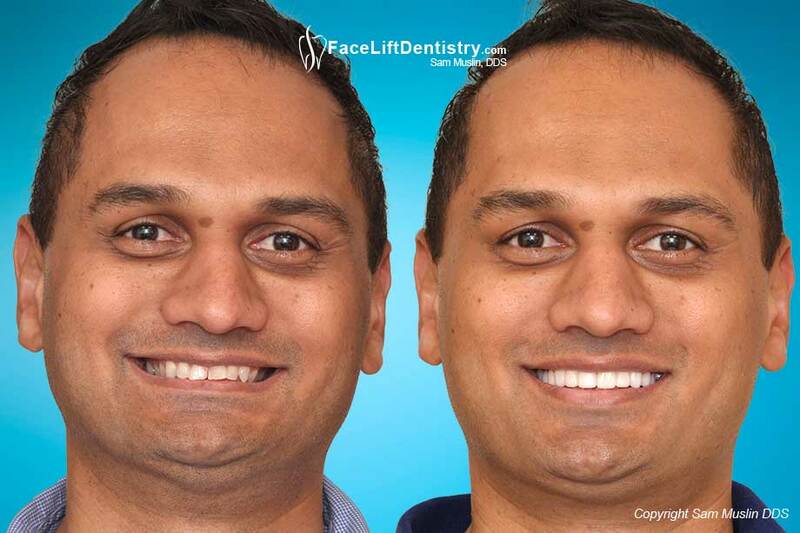 Jaw tightness, clenched jaw, narrow smile, headaches, poor bite, muscle pain, muscle tiredness, tension in face, chronic clenching, bite correction, TMJ treatment, VENLAY® method, Face Lift Dentistry® treatment. 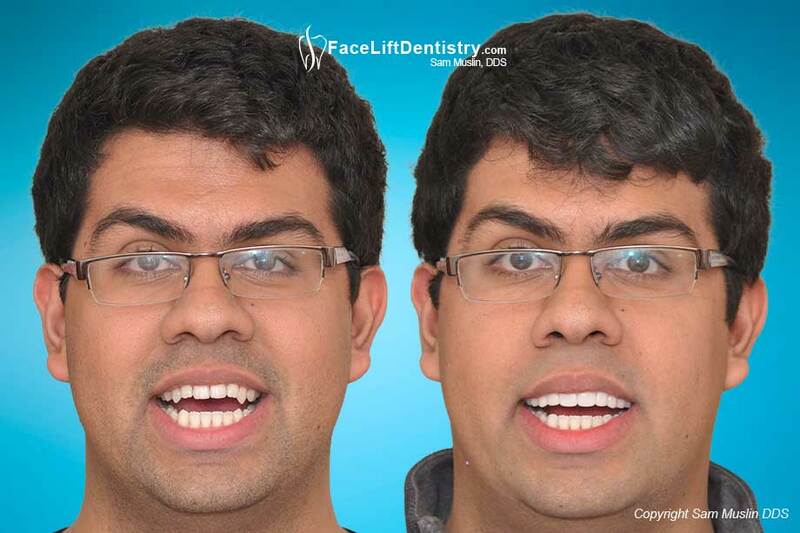 This patient flew in from New York to get his underbite corrected, his speech clarity improved and his headaches reduced. He refuses jaw surgery and braces that were recommended and clearly explains his feelings in this remarkable video. She refuses jaw surgery and braces. 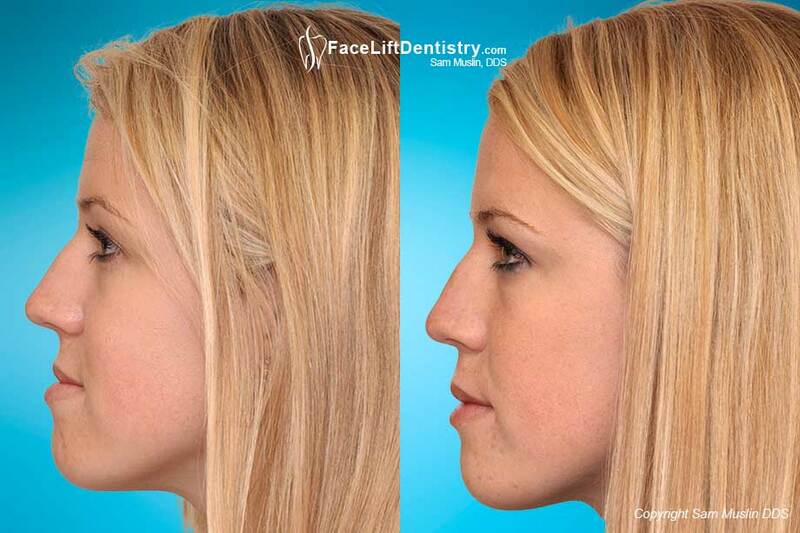 Porcelain veneer method suggested by others couldn’t improve her facial profile. 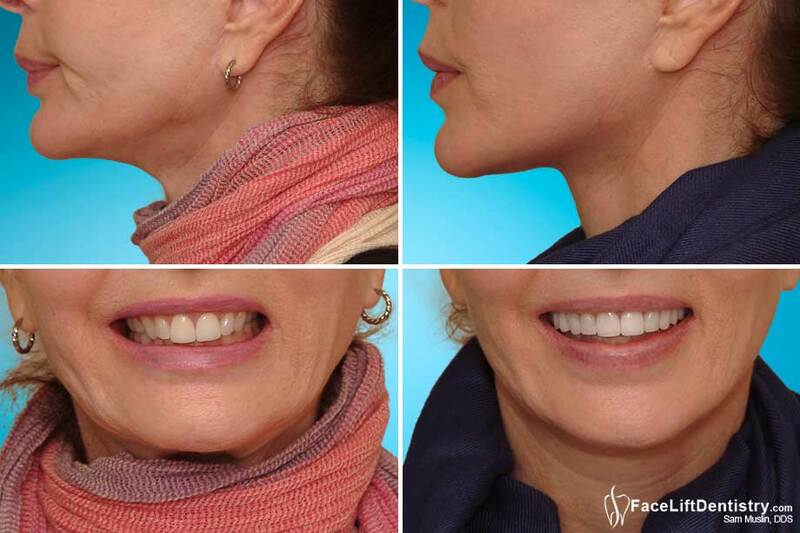 VENLAY® restorations, without any tooth grinding, gave her abetter facial profile and great smile. When teeth are worn down, the shape of the face shortens. He has premature aging from clenching and grinding his teeth. She traveled from the “middle east” to get her bad veneers replaced. She explains her story on the video clip. She was not going to get another bad set of veneers. After seeing seven dentists, she realized that nobody in her area could offer this level of care. 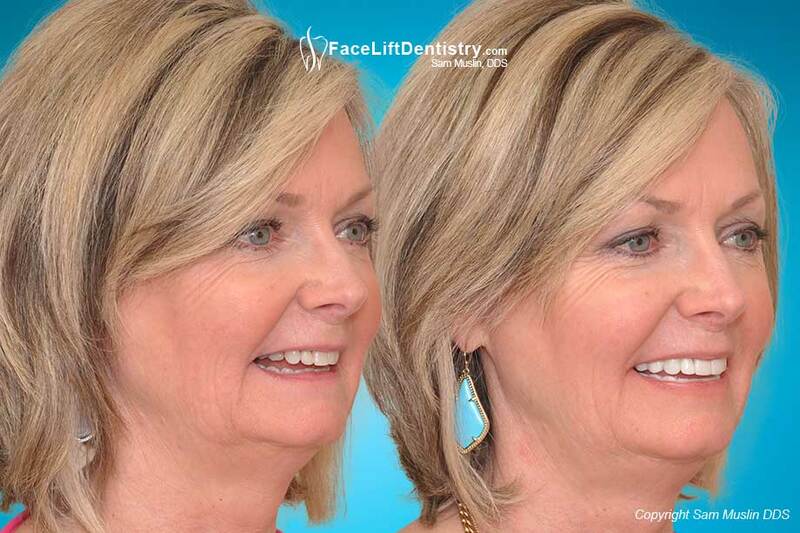 See the remarkable transformation of her face that literally reversed the aging process and relieved her headaches. A deep overbite and years of tooth grinding resulted in shortening his entire face. His lips were thin and his jaw was weak. 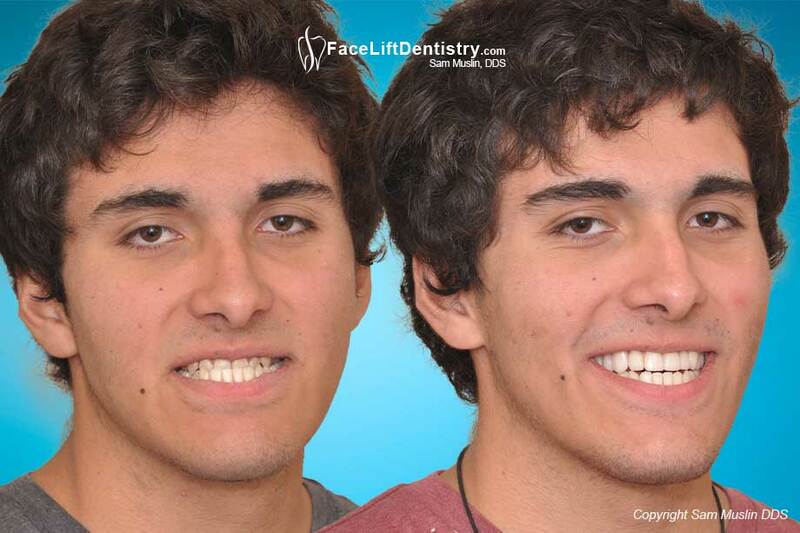 By correcting his bite with non-invasive VENLAYS® his face became balanced, his jaw is now stronger and his lips are much fuller. 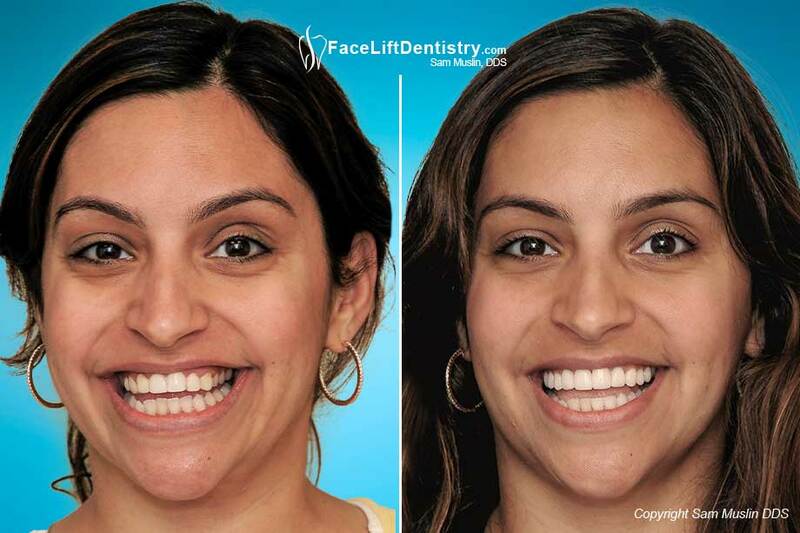 The Dental Face Lift provided this patient with a stronger looking jaw, fuller lips, permanently whiter teeth and a healthier bite. 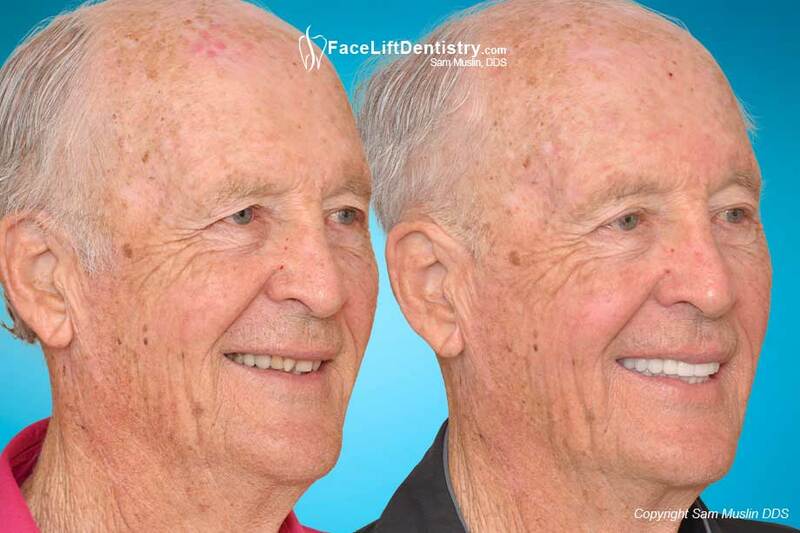 His wrinkles were reduced, his entire face is physically longer and no surgery was necessary. 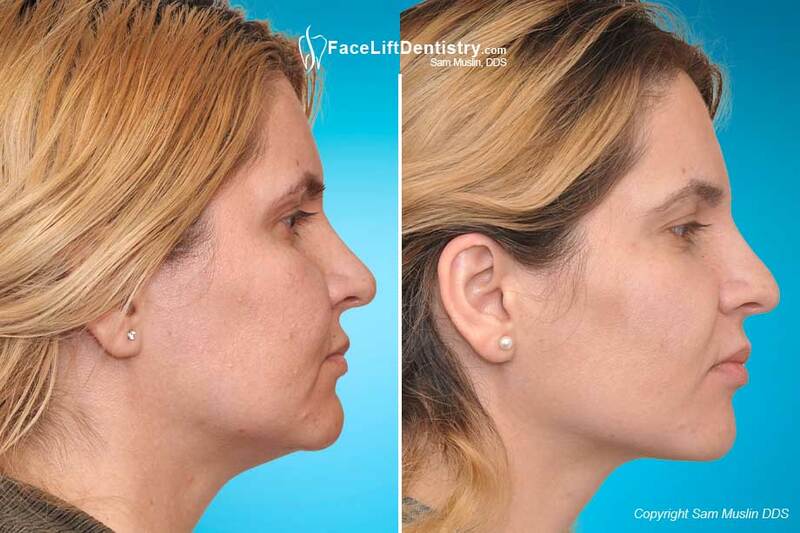 Bad facial profile and the aging face can be reversed in just a matter of weeks. Her headaches are gone and she looks years younger. 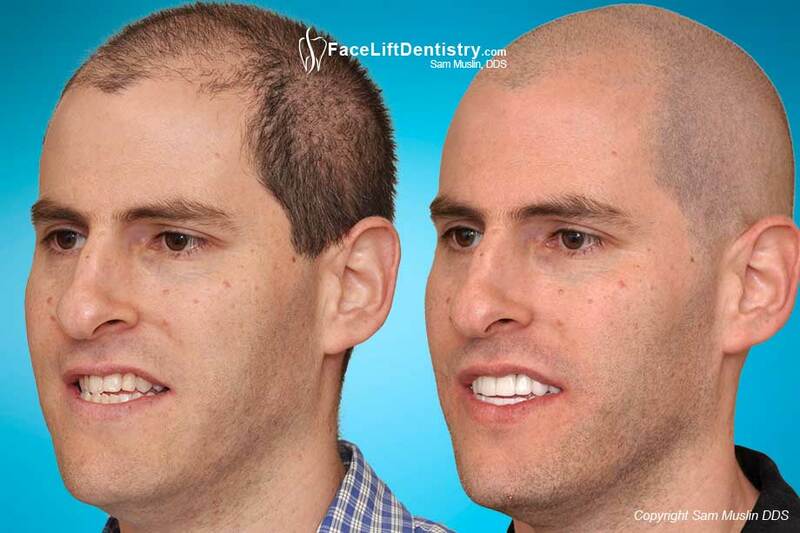 Small upper teeth and a narrow smile were treated with no-grinding and no-drilling porcelain veneers. 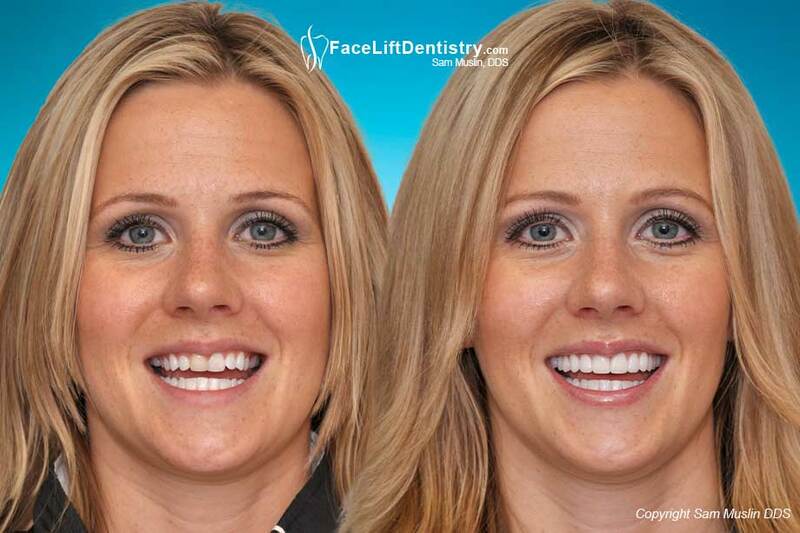 The micro thin dental veneers were custom made by Dr. Muslin's ceramist. 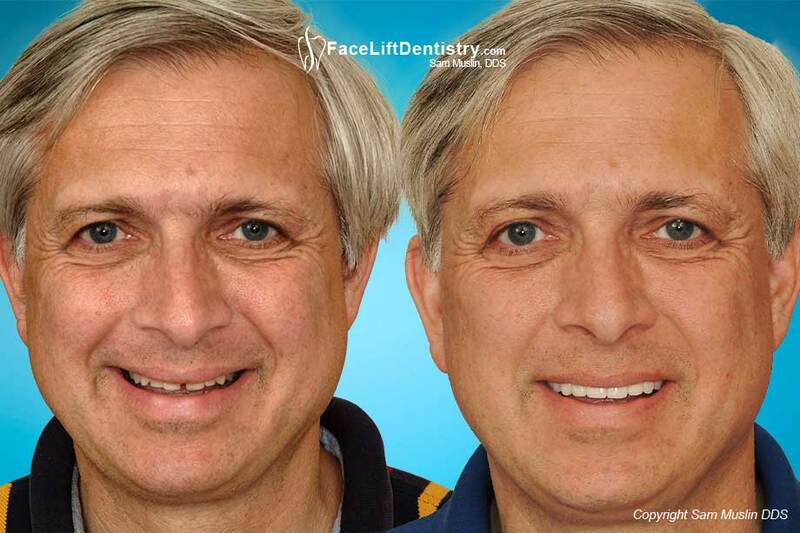 This patient wanted natural-looking veneers that were not too white. 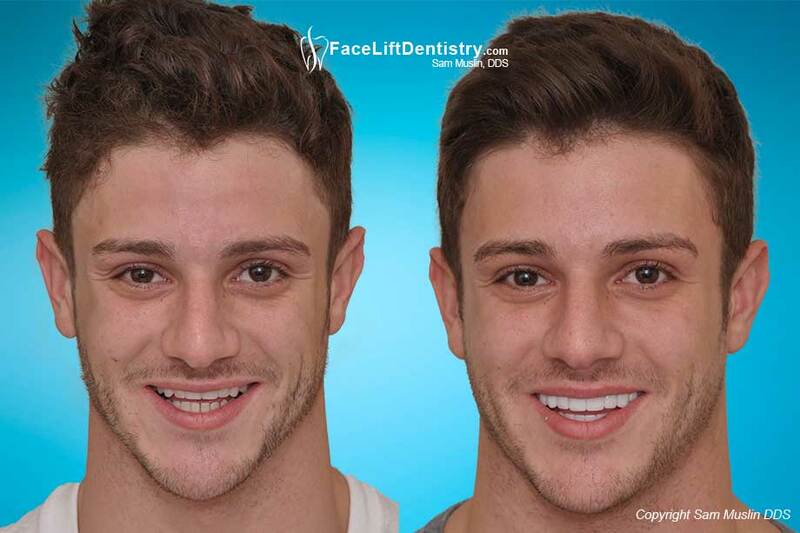 Beyond A Full Mouth Reconstruction because it is the Face Lift Dentistry ® procedure, Correcting a Protruding Lower Jaw and Sunken Lips, bad teeth, Improving your profile through changes to your bite and jaw position, Restoring the Presence of Upper Teeth In Your Smile. 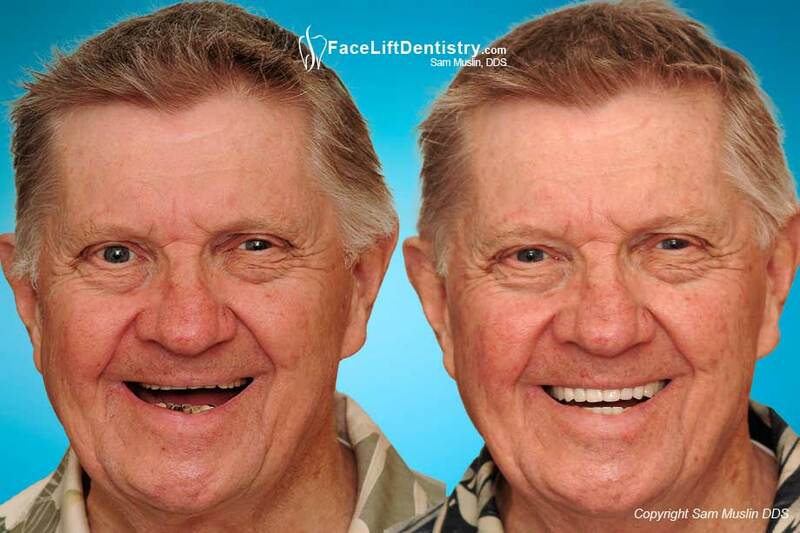 The upper teeth get shorter as we age and they begin to disappear. You cannot see her upper teeth when she is talking. Years of grinding down her teeth also shortened her face. She wanted her youthful appearance back and flew in from Canada to get what she could not get anywhere else. Dr. Sam Muslin is a Master of the Academy of General Dentistry. 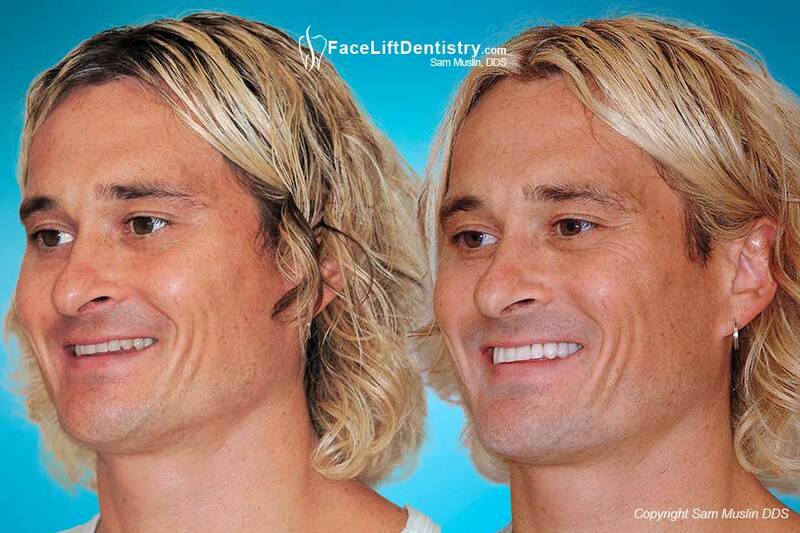 He has been recognised as the Best Cosmetic Dentist in Santa Monica for several years running by LA's Best. He has practiced restorative and reconstructive dentistry on the "cutting edge" for more than 30 years in Santa Monica, California. Dr Muslin's patients come from Santa Monica, Venice, Culver City, Playa Del Rey, Marina Del Rey, Mar Vista, El Segundo, West Los Angeles, Los Angeles, Beverly Hills, West Hollywood, Century City, Westwood, LA, Bel-Air, Brentood, Hollywood Riviera, Hollywood, Pacific Palisades, Topanga, Malibu, Pasadena, Burbank, Highland Park, Los Feliz, Silver Lake, Holmby Hills, San Fernando Valley, Calabasas, Encino, Canoga Park, Van Nuys, Thousand Oaks, Simi Valley, Camarillo, Ventura, Oxnard, Santa Barbara, Orange County, San Diego, Chatsworth, and San Francisco. Some of his international patients have come from Singapore, London, Paris, and Toronto. COPYRIGHT NOTICE: We have had a significant number of shameless dentists, advertisers and website companies steal the photos and/or the wording from this website and use them to market themselves or their skills to their customers. All the content on this web site, including images, videos and content, are Copyright © 2017 by Sam Muslin DDS, all rights reserved. No part of this web site, including pictures of our patients, may be copied, duplicated, published, distributed, displayed, or stored for public or private use in any information retrieval system, or transmitted in any form by any mechanical, photographic or electronic process, including electronically or digitally on the Internet or World Wide Web, or over any network, or local area network, without written permission by Dr. Sam Muslin. No part of this web site may be modified or changed or exploited in any way and used for derivative works, or offered for sale, or used to construct any kind of database or mirrored at any other location without the express written permission by Dr. Sam Muslin.